Dame Maggie and Princess Rose mingled with dignitaries and cancer survivors and their families. 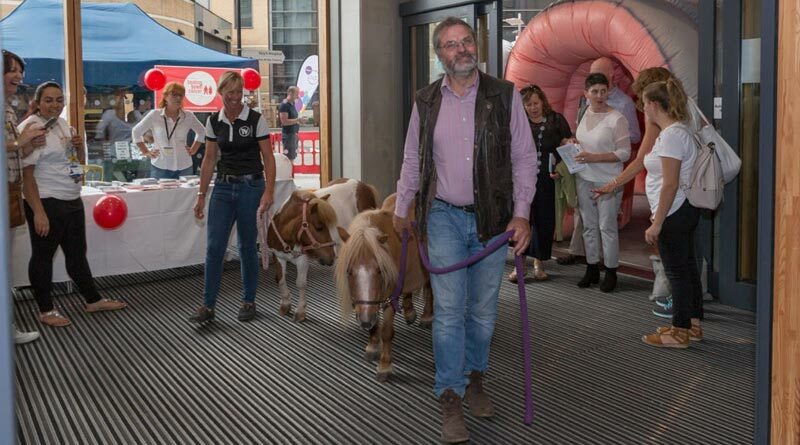 Two Blue Cross Shetland ponies who are now working as therapy animals trotted their way into Guy’s Cancer Centre to help celebrate Cancer Survivors’ Day last week. The ponies are on loan to the national pet charity to Equilibrium for Life, an organisation that uses horses and ponies for therapy and equine assisted learning. The equines Dame Maggie and Princess Rose, a mother and daughter pair, were handed over to the Blue Cross rehoming centre in Burford, Oxfordshire, after their original owner could no longer look after them. The ponies regularly visit hospices, care homes and autistic play schemes, and they won over more fans at the Cancer Survivors’ Day on June 25, an annual event run by Guy’s and St Thomas’ NHS Foundation Trust. The event at Guy’s Cancer Centre is a special annual event for the hospital patients, their families, care givers, staff and the community to celebrate cancer survivorship. As well as guests being able to meet the ponies, the day included a fashion show, health and well-being activities, live music, exhibits, seminars, reflection and contemplation. Therapy ponies Maggie and Rose make their entrance at Guy’s Cancer Centre. Alexandra Taskin, owner of Equilibrium and the ponies, is hoping to adopt the pair permanently.